​​This conference is an incredible gathering of people in who are looking to learn more about alternative health, energy medicine, more about the science of the energy systems, herbal remedies, color therapy, overcoming addictions, strengthening relationships, light therapy, crystals & stones, holistic business support, hypnotherapy, the law of vibration and more. 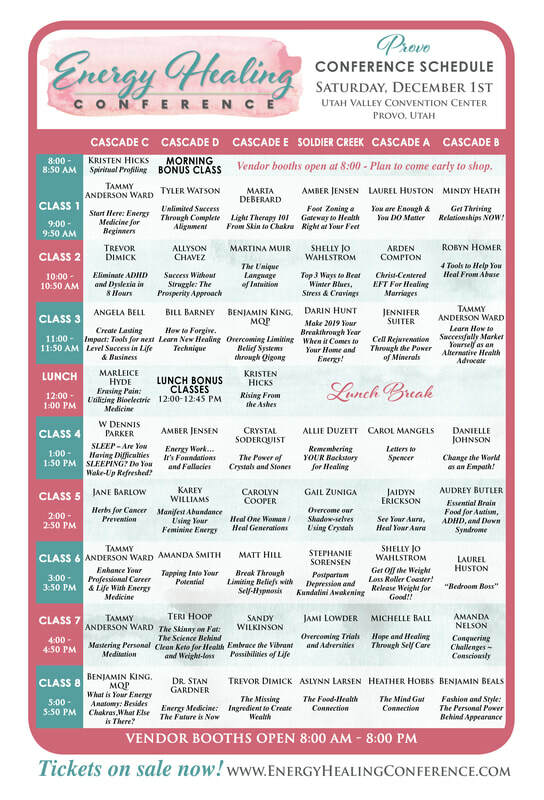 Check out our Presenters and Classes! This very informative class for beginners will cover energy medicine definitions, basic energetic awareness and techniques. We will also do an overview of my favorite modalities. Each class attendee will receive a digital copy of the presentation slides. ... so you can help even more people. There are 2 main core coverages in this class. Each participant is guaranteed to receive a ton of value during this power packed class. Whether you are a nurse, social worker, massage therapist, school teacher or parent, there are things you can do to help those around you energetically. In this class, Tammy will customize what she teaches to those helpers and natural healers in our community. You aren't as helpless as you feel sometimes. As you teach some of these simple techniques can really empower both yourself and the people you serve. Tammy Anderson Ward: Tammy has hosted dozens of life changing conferences (including this one!) since 2014 helping to bring clarity to thousands about energy healing. Her company has also published several books about energy healing and hosted dozens of intimate, affordable healing retreats. She is a popular speaker, mentor, conference producer, author and healing arts advocate. Tammy has mentored hundreds of clients and enjoys helping others reach their greatest dreams and life's aspirations. She is a mother of 8 awesome humans and grandma to one gorgeous baby girl. Carolyn Cooper is the creator of the SimplyHealed Method; an easy to learn and use energy healing method that cleans up the root of an issue quickly and gracefully. Clients report profound and life-changing results. For over 20 years she’s been training and certifying energy healers in her proven method, as well as presenting corporate workshops, and working virtually with private clients around the globe. Carolyn loves sharing practical tips that anyone can do, to help them “revive their vibe”. Catch her short “Energy Shot” videos on her SimplyHealed youtube channel or visit www.CarolynCooper.com for more information. Learn the important ways that visible colored light and near visible light is absorbed and utilized as a way to nourish, tune, release emotions and open up energetic pathways in the mind, body and spirit. See why light is called the "medicine of the future" and understand why it is a foundational tool in your energy healing toolkit. Marta DeBerard is a board certified Quantum Light Energy Coach. She has a passion for educating people about the all-encompassing energy of light to empower wellness on every level including physical, emotional, and spiritual. Originally from Boulder, Colorado, Marta was an Academic All American at the University of North Carolina, has over 500 hr in training and 18 years of experience as a certified yoga instructor. Marta holds a certificate in nutrition counseling and marvels at the speed and ease with which the body’s natural ability to be healthy and vibrant is innately empowered by light. As a LumiCeuticals education and training director Marta loves helping both individuals and practitioners light up their personal and professional wellness practice. We each have an extraordinary purpose in this life experience. All of us, not just some had such important rolls to fulfill that our creator gave you reminders, markers on your body to help you remember gifts, talents and abilities that come to you naturally. Feature Mapping is a way of using your own body proportions to discover your truest self. Imagine life without ADHD, Dyslexia, APD, Depression, Anxiety, and other life challenges. The root cause of these issues stem from brain function or the lack there of. Rocky Mountain Brain Integration has been correcting these life challenges for more than 6 years using a cutting-edge technique based on principles of applied physiology and acupressure. Experience what life is like with a fully functioning brain. Trevor Dimick is a Life Transformational Expert, Educator, Mentor and Speaker. He is the founder and owner of Transcend, LLC. He is also the founder and owner of Rocky Mountain Brain Integration, Inc.. Trevor graduated from Weber State University with his degree in Child and Family Studies and Psychology. He has earned his Certified Family Life Educator (CFLE) certificate from the National Council on Family Relations (NCFR). He has earned his Crossinology Brain Integration Certificate from the Learning Enhancement Institute. Trevor is the author of the Amazon #1 bestselling book The 14 Laws of Happily Ever After. SLEEP – Are You Having Difficulties SLEEPING? Do You Wake-Up Refreshed? Sleep is one of the most important components of mental health, weight loss, physical health, and overall well-being. Learn Positive Mind Management skills and tools for new mental and emotional control, and especially managing your sleep! Enjoy knowing that you are in charge of You! W. Dennis Parker is a noted Certified Clinical Hypnotherapist registered with the American Council of Hypnotist Examiners since 1991. (CHT 191-219). He is a Board Certified Clinical Hypnotherapist, Examiner, Instructor, and Approved School Operator. Dennis owns and operates the Certified Hypnotherapy Training School (CHTS) in Farr West, Utah. He has helped thousands of clients to overcome maladaptive predominant thought beliefs (thinking errors) which generate negative emotions and subsequent inappropriate behaviors. Dennis views emotionally induced pain and illnesses as behaviors and teach clients to overcome the emotional aspects of dis-ease. Herbs provide powerful, natural medicine when it comes to cancer prevention. And there are hundreds of herbs that have anti-cancer properties. Do you need to take them all? Learn why preventing cancer is actually easier than you think. Jane Barlow Christensen is an herbalist who owns and runs Barlow Herbal Specialties. She lives in Salt Lake City where she enjoys hiking all over the mountains of Utah and teaching fitness classes. Jane loves everything natural, holistic, wellness, fitness and nutrition oriented and believes it is our right as humans to be vibrantly healthy and that if given the right tools our body knows how to heal. She believes that each of us are responsible for ourselves and the love, joy, spiritual and physical health that we experience. She is the 2nd oldest of 14 kids and grew up in rural Idaho. Jane has two grown sons and two grandchildren. Understanding how crystals and stones work to help our spiritual, emotional and physical bodies is life changing! Learn more on how to use them, why you use them and where you can use these amazing tools in your life to gain understanding, healing and much more. Jennifer (a skin care revolutionary) will discuss the power and importance of minerals, as well as other essential nutrients, in achieving and maintaining healthy, strong, glowing skin. Good skin care is not a mystery! Jennifer Suiter is a mom, inventor, skin care guru, Founder and President of True Love Skin Care. Her mission in life is to share the knowledge and wisdom she has obtained about proper skin care. Skin Health is not a mystery, or even complicated! The key is direct, balanced, natural nutrition. Unfortunately, the big brands seem more intent on covering us with artificial chemicals than pure nutrition. So Jennifer started True Love Skin Care in 2015 to bring health to everyone. About 95% of our behavior is controlled by our subconscious mind. Hidden in the vast recesses of our unconscious are our belief systems, which ultimately aid our healing or keep us in dis-ease and illness. Learning to identify and evolve beyond limiting belief systems is the pivotal work of personal transformation – the very evolution of the soul. Come gain insight in how the ancient Chinese practice of Qigong, the world’s oldest energy medicine, can help you holistically heal and transform beyond limits. What is Your Energy Anatomy: Besides Chakras,What Else is There? Benjamin King is a Medical Qigong Practitioner, certified through the Tranquil Cloud Medical Qigong Institute based outside of Chicago, Illinois. He continuously trains under Dr. Tony D’Angelo, DMC (China) a doctor of Medical Qigong and 22nd generation Taoist priest. Benjamin is also the founder of Blue Petal Foundation, a non-profit organization based in Orem, Utah which is currently the only Medical Qigong treatment center in the state of Utah. Blue Petal Foundation is also an affiliate of Tranquil Cloud Medical Qigong Institute and is an extension of it, offering beginning level practitioner courses in Utah. He and his wife Cheryl have been married for 10 years and are the parents of six children. It’s the mission of his nonprofit 501(c)(3) to make the world’s oldest and most comprehensive energy healing modality available in Utah through treatment and training opportunities. An ancient energy modality growing today simply because it works. You can access spiritual, mental, emotional, and physical bodies of health, and all systems of your body at the cellular level, stimulating your healthy blueprint to begin its healing process. This is an interactive class, come learn more. Are you missing something to energy work or frustrated with how it works? Then this is the class for you. Energy work is meant to be simple, and effective for everyone. It is governed by divine laws, order and formulas. Come learn key components for energy work success. Amber Jensen is an international speaker and educator, Licensed Massage Therapist, Certified Foot Zone Practitioner, Certified Life Line Energy Tech, and gem expert. 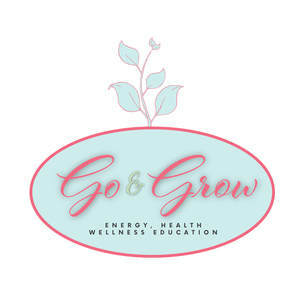 She is the co-owner and founder of Wellness Life Zone, Foot Zone Academy, and the Center for holistic healing and education, author of anatomy and physiology books geared towards a holistic approach to the body, and authored of the Gentle Healing Energy Course. She has discovered over 100 more acupressure points on the feet, advancing the foot zone technique to a whole new level for a more comprehensive healing response. Her greatest joy is her beautiful family. We all have access to our intuition. Sometimes it works in a similar manner as someone else but did you know you have a completely unique and individual language that only you can decipher and understand? This class will walk through the Intuition Process and introduce new ways to discover and develop your intuition. ​This class will teach you how to use crystals in a hands on way to over come the dark part of us that resides in each of our chakras. Gail Zuniga is a certified crystal healer, a medical intuitive, and an empath. She owns Star Valley Rock Shop and a successful crystal healing practice. Shes a wife and mother of 4 amazing kids. She uses crystals, herbs, and oils to heal her family and clients. Her ultimate goal is to raise the vibration of everyone one stone at time. Top 3 ways to Beat Winter Blues, Stress & Cravings. Many are looking for answers to relieve symptoms of anxiety, depression, winter blues, cravings, stress, addictions, weight gain, yet no one is talking about this inexpensive & easily accessible way… AMINO ACIDS. If your body needs them, you’ll notice a difference in 20 min. Amino Acids, along with nutrition & hypnotherapy, is an odd combination that creates miracles. Learn to relieve the above symptoms, increase energy, sleep, happiness, peace. Is this YOUR missing link to optimal health? ​Get Off the Weight Loss Roller Coaster! Release Weight for Good! How many weight loss programs do you need to be on until you finally say enough is enough? I am here to tell you it well it's time enough is enough! Come learn how to release weight mind body spirit and cravings for optimal health. Shelly Jo Wahlstrom ​Certified Hypnotherapist, Certified Recovery & Nutrition Coach, owner of Shelly Jo Hypno, & Shelly Jo Hypno Aminos Nutrition; Trains practitioners how to use Amino Acids with their clients. Hypnotherapist to help others release thoughts & emotional blocks, increase confidence & achieve goals. Drawn to Recovery & Nutrition to help those closest to her (especially a daughter) with addiction & mental health issues. Works with children to adults; weight, addiction, cravings, anger, anxiety, depression, fears, pain/illness, test taking, energy, sleep, confidence & overall Wellness. Married 33 years, three beautiful daughters, two great son-in-laws, two adorable grand daughters. Loves life. Message… There ARE Answers. They come UNEXPECTEDLY. THERE IS HEALING & HOPE. Life Matters… YOU Matter! Sandy Wilkinson is a Champion of people. Her greatest joy and purpose is to serve and support others to realize their individual greatness. She has extracted life lessons from many and spent a lifetime studying human nature and how we operate. An undergraduate student of psychology and human development intrigued and inspired her to learn and utilize the alternative healing traditions and modalities from various regions of the world, from ancient eastern to modern new age. Learning from and applying these sacred teachings in her life she has also learned how to assist others to develop their own restorative balance from within. She is a mentor and presenter of youth and adults inviting personal transformation. She leads with the heart and intention to create an understanding and application of the language of thought and emotion, empowering the physical and spiritual connection to bring the greatest impact in one’s personal life. Sandy is an accomplished energy healer, Foot Zoner and Healer's Blueprint practitioner. Transformation comes from within. With her life experience and training, she is adept to assist you to see within, moving forward in a fun and experiential application of personal introspection. Would you like to get better results without having to effort yourself into the ground? In this groundbreaking class, Allyson teaches you how to harness the power of your mind and commune with the forces of creation to permanently end internal suffering and create Success Without Struggle! Allyson Chavez is the Ultimate Prosperity Coach and a mental strength coach for entrepreneurs. She is a speaker on the topics of mindset, prosperity, universal laws, communication and relationships, and winning the inner game of business, relationships and life. She is the bestselling author of The Prosperity Approach. Her work has been featured on CBS, NBC, ABC, FOX, and hundreds of nationally-syndicated television, newspaper, and magazine outlets." Allyson teaches entrepreneurs mental strength to overcome obstacles and create business breakthroughs through webinars, group programs and live events. Visit allysonchavez.com for more information. The time is now! Get ready to make 2019 a breakthrough year and take the lives of your family to a whole new level. You will do this through your home. When we learn new concepts and ideas and implement them into our lives through organization, simple processes, and balanced décor; our lives change. Our spirits are lifted, are minds become clearer. Take this opportunity to learn and grow. Darin will be speaking on solutions and tools, ideas, and concepts that will change your home and your life. Darin Hunt There is no question regarding my passion for design. Over the years I have had the opportunity to enhance others’ lives through my common sense and affordable approach to home staging, interior design, and personal mentoring. Having a desire to help as many people as possible I came to the realization that I wanted to teach and share all that I know when it comes to design and decorating. I started mentoring, hosting classes, speaking at events, and have helped many create more time, energy, and certainly a better lifestyle. Our habits and behaviors that affect us become routine. Once we recognize and see another option we grow, and the world around us grows. The environment in our home rises to a whole new level. My classes and workshops are available. Visit my website atwww.homestaginganddecorating.com for dates and locations. I look forward to meeting you and assisting you in your home. Most importantly, ENJOY your day! What if healing and abundance were mostly a matter of aligning every cell and energy system in your body with the frequency of what you want? Come learn the technique I’ve used to help people overcome gluten and soy intolerance in a single treatment, manifest $10,000 in two days, regain physical and mental abilities after cardiac arrest, and much more. It is not rocket science, it is the science of alignment. Tyler J. Watson is a master energy healer and the creator of the Complete Alignment Technique (C.A.T. ), a landmark breakthrough in the science of getting real results from energy work. With more than 25 years of healing experience and mastery in hundreds of different modalities, Tyler now helps entrepreneurs, couples, and truth seekers uncover their hidden success blockers and live the life they’ve only dreamed about. He is a sought-after international speaker and coach and author of the #1 Amazon bestseller “The Enrollment Effect.” Most importantly, he is a passionate father and husband who loves to see people come alive. No matter how good or bad your childhood was, you picked up limiting beliefs along the way. The most effective way I have discovered to break through those beliefs is self-hypnosis​. You’ll learn a 3-step process that you will be able to use over and over again by yourself. Discover powerful tools for navigating the "Dark Side" of your feminine nature. Join us in this groundbreaking discussion that will transform the way you perceive and experience the childbearing year. It's time we take full ownership of our births, our postpartum experiences, and our femininity. Will you accept the gift? Stephanie Sorensen is a 200-hour certified yoga teacher, working to complete her 500-hour certification, under the tutelage of Syl Carson at Bodhi Yoga, She is the founder of Bodhi Birth, working as a prenatal and postpartum yoga teacher, birth and postpartum doula, a childbirth educator, and a Thai Partner Yoga practitioner. Stephanie is passionate about the profound impact yoga has on giving birth, emotional health, and spirituality. Stephanie is married to Nicolas Sorensen, an intuitive deep tissue massage therapist, life coach, Tai Chi instructor and owner of Embody Wellness. Together they're raising four children in Provo, Utah. Bill Barney, is the author of the Life-Changing book, "Shine the Light Within – 5 Steps to Lighten Your Soul Through Forgiveness." Bill is an Intuitive Practitioner of Energy Medicine and specializes in over 20 different modalities and techniques, seven of those are unique modalities and processes that Bill has pioneered and developed over the years. Bill loves to clear energetic imbalances and teach others to gain control of their life and their health. He believes healing occurs from the inside out. Bill married his sweetheart for 34 years ago. He is the Father of 4 married children and 4 grandchildren. Benjamin Beals is a power-house of passion and play! He is a Model, Personal Stylist and Fashion Consultant. As a boy in AZ, you’d have found him doodling a dress as he dreamed it on a red carpet in Paris. On his journey of self-development he’s had questions, like, “What makes a person credible?” “What makes a person pop?” “What makes a person feel they can show up with full-on confidence?” These questions led him to pursue fashion more and more. For the last four years he has been helping others show up authentically, confidently and chic. His purpose is to combine style and message, inner and outer, soul and body. Experience spiritual profiling firsthand as Spiritual Messenger and Profiler, Kristen Hicks, known for her ability to profile and reach those from the other side, will select volunteers as she is guided through a whole breakout session of focusing on you, the audience. She will also touch on learning how to uncover strengths and weaknesses, triggers, underlying emotional causes, and potential barriers. Learn how to release those things no longer serving its purpose and gain clarity and a deeper understanding of yourself and work towards finding your passion. I will be speaking about how I came to see and understand the Aura and how to use energy healing to heal the energetic imbalances and promote a happier, healthier physical experience. Jaidyn Erickson was born and raised in South Eastern Idaho and has always had an affinity for all things creative and spiritual. She strives to live her life through authentic expression knowing that as everyone shares their gifts, the world will be lifted. Jaidyn is passionate about energetic healing and helping others create and maintain balance in their energy so as to build a more happy, and healthy physical experience. She is a certified Holy Fire II Reiki Master and specializes in working with the aura and chakras. When she's not healing the world, Jaidyn can be found rolling on the floor with her two young daughters, painting, and bingeing The Office on Netflix. Train the brain to stop working against you. Discover how to make your life & your clients lives Automagic. Become 10x more effective with 10x less effort. Learn our Sassy Science and daily Neuro Hacks for even better results than you are getting now. Angela Bell is known as the Results Queen and is founder of Neuro-Life Coaching. She provides effective neuro strategies to achieve next level success in both life & business for AUTOMAGIC results in every area of life. She is a successful Author & Speaker, having appeared numerous times on ABC, national radio programs, and stages throughout the United States. She is known for her sassy science that changes entrepreneurs into millionaires and trains coaches & healing professionals into transformational magicians. When she speaks, people often comment on her effervescence, authenticity, and down-to-earth style; whether they meet her in person or not, people often feel like they’ve made a new friend. Let’s face it, life is hard! But what if I told you that what you’re facing today doesn’t actually define you? What if I could show you a way to not only survive life’s hurdles, but how to thrive through them. Join me as I share tools and techniques that will help fortify you not only physically, but spiritually and energetically as well. Jami Lowder is a single mom to four handsome little boys. Though life has thrown every twist and turn imaginable her way, she has learned how to navigate through even the toughest of circumstances with joy and enthusiasm. Each trial has made her stronger and more confident in who she is. Jami is a certified Reiki Master and her mission in life is to help others find the hope and light within to conquer whatever life may bring. Join Master Energy Therapist, Karey Williams in this fun and interactive discussion about the importance of connecting to your divine feminine energy in order to manifest the abundance you are seeking. Karey Williams, MRET, is a stand for love and for your divine worth and freedom. She is a talented lifecoach and healer working with individuals and groups in her energy therapy practice and classes. She combines her gift of seeing energy with her knowledge and certification of multiple healing modalities including: RET, EFT, WINGS, Light Language, Meditation, Breathwork and Energy Medicine. She has taught at Women in Motion, Carol Tuttle’s Energy Healing 101 and Manifesting More Money and Dressing Your Truth Facilitator Certifications, and Utah Parenting Conference. She loves being a wife and mother and to travel, seek knowledge, hike and shake her bootie! 8 years go, Robyn was in an abusive relationship with a diagnosable psychopath. She will share bits and pieces of her story with you but 95% of the time in this class will be spent teaching you about tools that will help you stop living in the pain of your past and start creating the amazing life you want and deserve. Robyn Homer is owner and founder of My Name is Courage, a business dedicated to empowering women who feel weighed down by the abuse in their past. She is passionate about teaching women how to love their life, rather than mearly surviving it. Robyn is now married to a man who treats her like a queen (even if he did hit on her as his waitress) and they have two beautiful children. The food we consume day in and day out has an effect on us. In our busy lives we seek what is convenient rather than what is healthful. Join me in “The Food-Health Connection” to change your perspective on food and the role it plays in your life. Aslynn Larsen is a Holistic Health Coach and Foot Zone Therapist. She has a passion for educating others about food and the effects it has on our bodies. She believes that when given the proper nutrition and tools the body can and will heal itself. Aslynn has been on her own health journey over the past few years. During that time she has gained education and experience healing the food allergies of her young son and other serious health problems of close family members. Since then she has been guided to a career in health coaching where she works with clients. She loves helping them take control of their health, starting with the food they eat. A Journey of through Death to Life, Have you ever wanted to heal from tragedy and loss? Have you ever felt lost or alone on your life’s path? Learn techniques to navigate your path, even when facing trials or loss, as Carol candidly shares her tender journey of healing after the death of her son. Carol Mangels Author. Speaker. Coach. Married 34 years to her Green Beret Special Forces husband, mother of 10 amazing children, grandmother of 7 extraordinary kiddos, Carol Mangels brings real-world experience to the training table. She teaches mindset and skill set development with principle-based techniques. Hundreds have learned from her hard-fought life wisdom and the “one breath, one step, one smile at a time” approach she brings. Her life’s mission is to teach and inspire parents, youth, and families to connect within themselves, to develop a love of learning, to find their life’s purpose/mission, and to actively serve those they influence. Change the World as an Empath! Are you overwhelmed? Empaths are filled with intuitive gifts but living in this world as a highly-sensitive person is hard. In this class you will discover how to protect yourself with boundaries that will allow you to use your gifts to bless others. Free checklist to all that attend. Danielle Johnson is an empowerment trainer, mentor and speaker. She is a Healer’s Blueprint Certified Practitioner and is the founder and owner of Choose You, LLC. Danielle has a heart for serving and mentoring highly-sensitive people who struggle with their intuitive gifts. She has unique experience in helping them create boundaries, develop their gifts and be the bright shining stars they truly are. She provides her clients with tools that can help them move forward successfully in their life. She lives in Provo and is happy wife and mother to 5 beautiful children. Do you feel like you try and try but you still are not getting the full results you desire in life, love, marriage, parenting, health or money? Come to this class learn the principles and skills of healthy, thriving relationships and lives that you can implement now for immediate results! Mindy Heath is a Love and Relationship Coach who helps women and couples heal and get the results they really want! Through 8 years of mentoring, speaking, writing, and now with her podcast Living The Joyful Life, Mindy teaches the specific principles and tools that lead to joy, peace and thriving relationships! Mindy is a graduate of BYU with a Marriage and Family Sciences degree, a Certified Therapeutic Guided Imagery Facilitator, Wife, and Mother. Her passion is helping people heal and learn so they can be their true selves and thrive in their most important relationships. Have you ever wanted something to come into your life and no matter what you do it seems to push itself farther and farther away. So many times we are not using the Laws of the universe in the correct energy. What if you could SEE your Vision come to life with just a few shifts of perception. I am excited to give you some tools to change your life. This is the first time I am speaking at a Hope Haven Event and I am beyond excited to meet all of you!! Amanda Smith is a metaphysical intuitive with a passion for helping people shift into a healthier, more joyful vision for life. While Amanda has experienced the pain of grief, including during her service in the U.S. Navy, she also battled cancer and emerged triumphant. She believes life’s most challenging struggles can become blessings when properly focused in the healing process. Utilizing her deep spiritual connection, she saves lives by tapping into the potential, the passion and the hope in those she is called to help. Amanda is a certified Reiki master and Ho-oponopono practitioner with a Master’s Degree in Metaphysics. Do you ever feel stressed, overwhelmed, and frustrated? There is hope. Did you know that your ability to overcome challenges and solve problems improves when you address your need to heal and nurture yourself? If you are searching for the peace that comes from self care, this class is for you. Michelle Ball is a woman of vision. She helps people see possibilities they didn't know existed. She teaches people to try new things, discover their voice, speak their truth, take action, solve problems, overcome challenges, reach their goals, find freedom, and create the life they desire. Michelle influences others to look beyond the obvious to search for what else might be true. She enjoys educating people about self care, health and wellness, essential oils, organization, and time management. Michelle is a presenter, mentor, and wellness advocate. She enjoys travel, yoga, hiking, music, and spending time with her husband and children. An exploration into the evolution of medicine, how energy medicine was relegated to a "second class" status but now is embraced in conventional medicine. Attendees will learn some of the most recent discoveries in energy medicine and a marvelous "de-stress" technique for relaxing. Dr. Stan Gardner is a medical doctor who specializes in Functional Medicine. He is a Certified Nutrition Specialist and is Board Certified in Anti-Aging and Regenerative Medicine. A popular speaker back East, Dr. Gardner relocated to Utah and now is passionate about helping people get well from the inside out, without drugs and surgery. These neurological disorders are not set in stone by genes gone wrong. Often they are accompanied by reduced functionality in normal biochemical pathways. Come learn how food choices can improve gut health, digestion, neurotransmitters, and detoxification. I’ll discuss new scientific research, help for extreme picky eaters, and how to know if specialty diets (Feingold, GAPS, low-oxalate, etc.) can help. Audrey Butler is passionate about using the power of food to lay the foundation for health. She believes the body has the incredible capacity to balance itself when given the necessary building blocks. Audrey is a BYU graduate in Nutritional Science and a Certified Health Coach. She has done advanced practitioner training with the BioIndividual Nutrition Institute, including pediatric training for autism, ADHD, and other neurological issues. She is an expert in creating customized diet plans based on each individual's unique body chemistry. Audrey loves experimenting with new recipes in the kitchen, gardening, and exploring the beautiful hiking trails near her home with her family. The greatest joy and pain in life can be found in marriage. Unresolved emotional Pain from past events, and fear of being hurt again, limit the joy in marriage. Dr. Arden Compton will demonstrate with class volunteers how to use Christ-Centered EFT to address these concerns to improve one's marriage. Dr. Arden Compton has been doing energy work full time for 15 years.He loves setting people free! He uses his own blend of five modalities to serve his clients, and has seen great results in freeing people from PTSD, addictions, food allergies, anxiety, limiting beliefs, chronic pain, etc. ​Mortal birth is not our beginning. We come to earth with trauma from our own pre-birth work as guardian angels, the War in Heaven, and more. Explore perspectives on healing soul wounds developed before you were born--remembering the CONTEXT for YOUR mortal experience. Allie Duzett is the author of the book The Context of Your Life: Understanding Who You Are and How To Unlock Your Gifts By Remembering Your Own Backstory. Most of us don't realize we have a second brain. This our gut system; it is just as intricate as the brain and plays an important role in our body system. Recent research links the gut biome to many mental health disorders such as neurodegenerative disease, autoimmune disorder, type two diabetes, autism, depression and anxiety. ​Heather Hobbs is a mother of seven beautiful children. She is a teacher, mentor and presenter. Heather is a facilitator of various tutoring programs as well as a community director for Dr Nedley's Depression and Anxiety Recovery Program. She is a business owner of By Design Learning Center as well as a brain enthusiast of eight years. Heather has a great love for learning and a passion for sharing what she has learned with others that they might benefit. ​ The science behind clean keto for health and weight loss. Teri Hoop started Keto Mamas after having her own life miracle with the ketogenic diet. Now she is sharing this message with others by providing free resources to help women and families sustain this lifestyle for health and weight-loss. Her website ketomamas.com provides free information and recipes, but her private facebook group has even more free resources to support you in your health journey. In just a few short months, Keto Mamas has over 6000 Instagram followers and 26,000 people view her pinterest recipe boards every month. Teri lives in Santaquin, Utah with her husband and 6 children. There isn't a right way or a wrong way to maneuver through Challenges-- there are simply choices. But, there are ways of engaging with challenges that can actually help you create more peace, flow, synchronicity, abundance and ease. And who wouldn't want more of that in their life?! This is a class where we will identify and begin releasing the primary subconscious role that's been keeping you cycling and re-acting to life, versus creating and re-sponding with it. We'll also equip you with teachings, tools and practices that support you in your on-going journey into more Joy, Love and Freedom! Amanda Nelson is an intuitive Speaker, Coach and Energy Medicine Practitioner who is gifted at supporting others in shifting into, and living from their Highest & most Authentic Self. She is the Co-Founder of The Sophrenic Collective and the Communications Director at The Bodhi Bridge Foundation where she loves to serve, lead, facilitate, connect, create and PLAY. She is married to her amazing and supportive husband Jeff, and together they journey life with their "Brady Bunch" family-- Bridger, Sydni, Cooper, Gentry & Reese. She is a living example of what is actually true and possible when you let go of "what is happening to you" and begin living from the place of Creator. What is the purpose of pain? Basically, to protect an injured part of the body from further harm. Why then after time has passed do pain signals continue? There are many answers to this and most can be addressed and even resolved using microcurrent biofeedback therapy. This class will answer what it is, how and why it works and where to start. free tickets plus goodies & more!